GFA-supported workers provide compassionate care to those who have faced lasting effects from leprosy, like this woman and like Kajri. Wind whipped through the plastic sheets, lifting them to the sky as they strained against the bamboo frame. Huddled inside the small, sparsely thatched structure, Kajri shielded herself from the sharp wind as her plastic walls waved above her head. The home wasn’t much, but at least she had one. 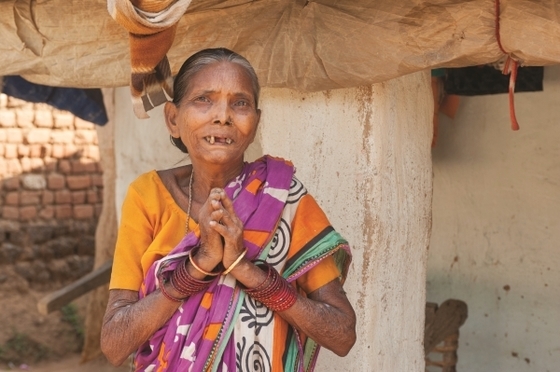 Kajri lives in a leprosy colony where most of the residents have small thatched homes just like hers. The people in her community earn a meagre living by begging or collecting scraps discarded by others to sell at the market. A bright moment breaks into these lives, so vastly altered by leprosy, when GFA-supported Sisters of Compassion come to visit. These five ladies visit the leprosy colony every day. 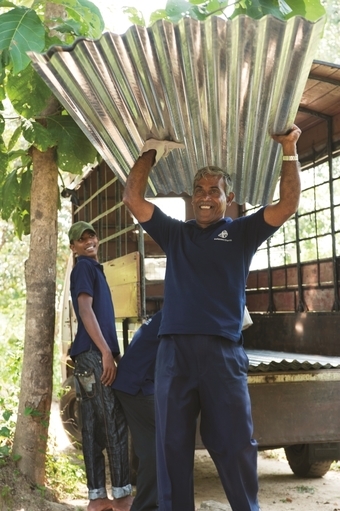 They help with personal hygiene, clean and bandage wounds and tidy up the leprosy patients’ homes. In Asia, the stigma of “uncleanness” persists in many leprosy colonies. The physical deformities created by the dreaded disease limit the options for manual labor, often the only work leprosy patients are deemed worthy of. Seeing the impossibility of getting work as a leprosy patient, the Sisters of Compassion arranged for a distribution of income-generating gifts for this impoverished community. On the day of the distribution, the leprosy colony was suddenly filled with the sound of cows mooing, piglets squealing and goats bleating. These living gifts would provide milk to sell and offspring to raise, multiplying the initial gift. Kajri, sitting among the crowd gathered, was too old and weak to care for a cow or goat. But God knew what Kajri needed, and animals were not the only gifts available. When her name was called and she approached the front of the crowd, a bundle of shiny tin roof panels was presented to her. The Sisters of Compassion installed the tin sheets for her. Their gift spoke God’s powerful message to her heart—you are known, you are loved. Now, under her newly built roof, Kajri no longer fears storms. She waits for the sisters’ daily visit, wanting to hear more about the God they serve.